I grew up in West Bengal, India – and while my parents and family are from Uttar Pradesh – both my brother and I identify more with Bengali customs rather than the usual north Indian customs. And Durga Puja – the 10 day, whole city stopping, arrival of Ma Durga to her father and mothers house – is my favorite Bengali tradition. We also grew up celebrating all the north Indian festivals with equal fervour, but Durga Puja – tops the list. New clothes, school holidays, lots of pandal hopping – even more fun when the community cultural programs were celebrated – all meant being foot loose and carefree for 10 huge days. The tradition follows the lunar calendar, and is steeped in mythology with Durga coming to meet her biological parents – from her husband Shiva’s home – and during that time fighting Maheshashur ( an evil demon – half buffalo, half man) and conquering. Durga, comes home…home with her children – Ganesh, Lakshmi, Kartikeya and Saraswati. All these are deemed as Gods and Goddesses back home, and are worshipped for whatever they are known for ie. Lakshmi for wealth, Saraswati for knowledge etc. Now I don’t want to write what can be googled and learnt – so I’ll just share my story about it all. 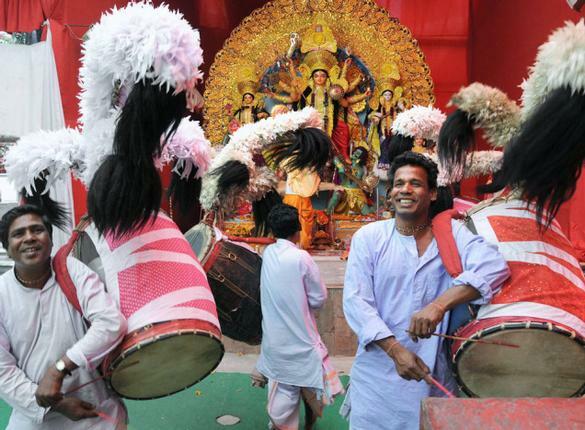 And once again….I heard the Mahalaya..and am counting the days of Panchami, Sashti, Saptami, Ashtami, Navami and Dashami ( 5th day, 6th day, 7th day, 8th day, 9th day, 10th day respectively) with the rest of West Bengal. 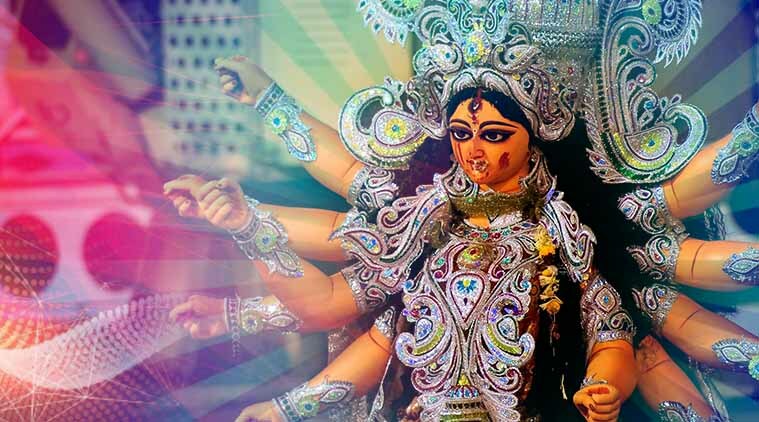 In the northern part of India, the rest of the Indians will celebrate ‘Navratri’ – 9 nights – 9 nights of celebrating Durga with dancing, prayers, community celebrations etc. You head into a mosque for prayers for Eid, you head into a temple to offer prayers to Durga/Kali/Saraswati/Hanuman/Shiv/Ganesh etc …and you head into church for midnight mass too, it does not matter which religion you follow – you celebrate it all -because you can, and because its what you grew u doing – tolerance, acceptance and understanding. And now…right now – there are no morning mists rolling in, no Mahalaya on the radio…and still I can smell the incense, the dhuno, hear the dhakki as he gets ready to pour his devotion on the dhak, I can hear the conch shells blow….. ..I want to go home…. Do you have traditional festivals that remind you of your younger years?